I am a big fan of the Irish novelist, Sheila O’Flanagan and with each new book from her, I know that I am going to be in for an enjoyable read. Her latest book, Things We Never Say is just as good as any of her other books that I have read and it is a book that just makes you want to keep on reading. 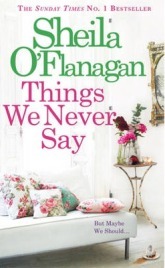 Things We Never Say tells the story of a somewhat dysfunctional family living in Ireland and a young woman living thousands of miles away in California. Abbey Andersen’s life has never been that conventional. As a child, she and her mother always travelled but years later, things changed when her mother decided to become a nun and live a simple, solitary life. Recently, her boyfriend has walked out on her and she is having trouble making ends meet. Things seem pretty desperate but suddenly, out of the blue, there comes an answer to her problems. Across the Atlantic Ocean, in Ireland, members of the Fitzpatrick family are also having trouble making ends meet. Therefore, although they are saddened at their loss, when their father Fred dies, leaving what should be a substantial estate, it should be the answer to their financial worries. But Fred had been harbouring a secret for the last fifty years – a secret that brings Abbey to Ireland and leads to a nasty conflict that leads to a legal contest over Fred’s will. I won’t say any more about the plot so as not to spoil it, but it is an intriguing and absorbing read about a warring family. It was fascinating to read how one man’s will can bring so much trouble which also provides a cautionary message about how money may not always be accompanied by happiness. There’s also the promise of romance as the lawyer who tracks Abbey down in San Francisco is very attractive. There is an element of ‘will they – won’t they?’ and the reader can only guess as to whether they will get together and make a transatlantic relationship work. I loved all the characters in the book and really sympathised with some of their predicaments. Things We Never Say is a great story about people and relationships and definitely held my interest from the very first page. It’s an extremely satisfying read and is highly readable. This is definitely Sheila O’Flanagan at her best. I am very grateful to the publishers for sending me a review copy. One Comment on "Things We Never Say"